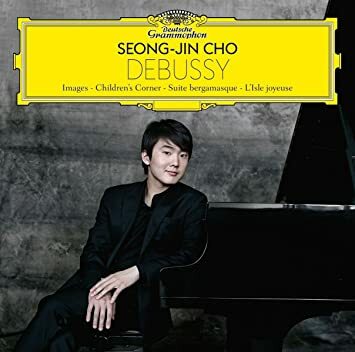 In a short span of time, pianist Cho Seong-jin has risen from an unknown musician to a household name in Korea who shatters classical music records. His popularity has grown since he won the highest prize at the prestigious International Fryderyk Chopin Piano Competition last October. “It’s been almost a year since I’ve been back in Korea and I’m both anxious and happy to be back,” said Cho, during a press conference at the Seoul Arts Center on Monday, just hours after he arrived back to Seoul. “I want to thank everyone for their continued support and for cheering me on,” he added. Cho and his fellow Chopin competitors are in Seoul to perform in the competition winners gala concerts, scheduled to be held at the Seoul Arts Center on Tuesday. Tickets for the evening concert sold out almost immediately, prompting organizers to add a matinee show, which also sold out. As part of the concert program, Cho will perform his winning repertoire, Chopin’s Piano Concerto in E minor, Op. 11. Cho is being closely watched both in Korea and abroad. 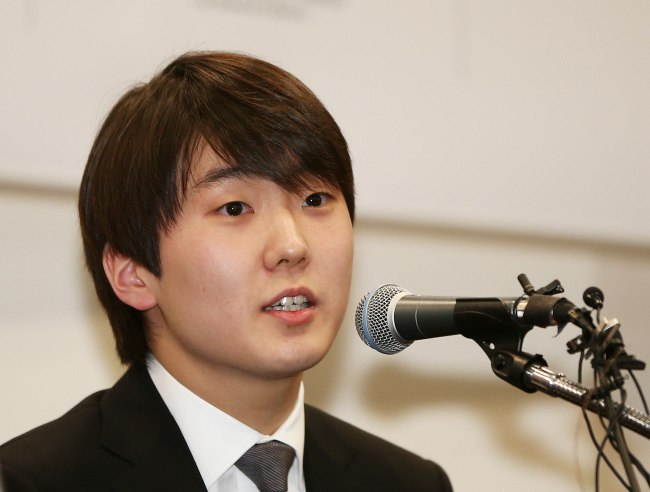 His interpretation of Chopin at last year’s competition captured the attention of the people of Poland. On Nov. 6 last year, Deutsche Grammophon launched the Korean release of the live album of Cho’s finale performances at the Chopin competition. The album flew off the shelves, with all 50,000 copies sold in less than a week -- an unheard of accomplishment for a classical album in Korea. Cho has been widely credited with changing the face of classical music on an international level and sparking local interest in the classical music genre. “I’m not sure whether it’s true that more Koreans are taking an interest in classical music because of me, but that would be great news for any classical performer,” said Cho. The pianist recently signed a five-year contract with classical music record label Deutsche Grammophon for the release of five albums. Cho will be releasing a second live album, featuring his performances from the preliminary and final rounds of the Chopin competition. He is also scheduled to start recording Chopin’s Piano Concerto No. 1 and Chopin’s four Ballades under the baton of maestro Chung Myung-whun and the Deutsche Staatskapelle orchestra in April. “I can assure you that the world has been looking at what has been happening here in Korea and we are stunned, surprised and overwhelmed at your support and interest,” said Ute Fesquet, vice president of artists and repertoire at Deutche Grammophon. “All of us know that Chopin’s music is one of the most difficult in the world ... 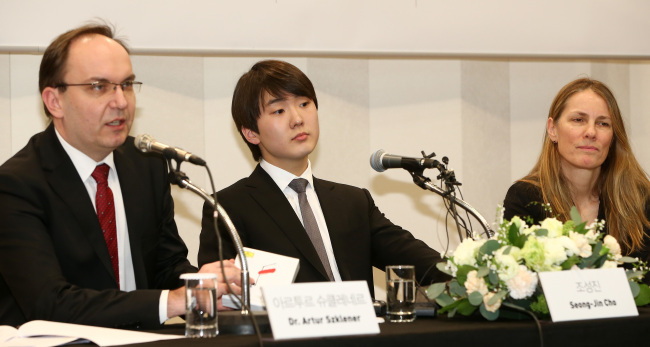 I don’t know how you do it,” Szklener said, referring to Cho. Despite all the praise, the young musician does not put on airs and replied to questions humbly, even jokingly downplaying his accomplishments. Cho shared that one of the reasons he had decided to pursue the piano over the violin was that “with the violin it is very difficult to practice, because you’re standing the whole time, but with the piano, you can just sit. The pianist also responded to a rumor that has been making the rounds on social media -- Cho had stashed away his smartphone for a few months to avoid distractions during his practices. “I live in Paris now and actually somebody stole my smartphone,” said the musician. It is difficult to conveniently summarize what Cho is as a pianist. His technique is excellent, but doesn’t really define him. There is not a single performance here to blow away the listener, but a more subtle, holistic approach to the music from beginning to end. The clichés of “dark,” “fiery” and “demonic” that sometimes attach to piano prodigies even when they are not warranted are, largely, not applicable here. There is a quiet inner-contentedness to Cho’s playing. In a world where it is near-standard practice to commit suicide on stage while performing Chopin, the first revelation of Cho as an interpreter is to accept a Chopin that is deeply, fundamentally, happy. In his hands “tortured” becomes “reflectively reposeful”; “tragic” becomes “exultant” or “rhapsodic.” Cho’s Chopin is easygoing and free. Instead of a nuclear arms race of escalating tension, Cho is soft-spoken, noble, lighthearted, unencumbered. 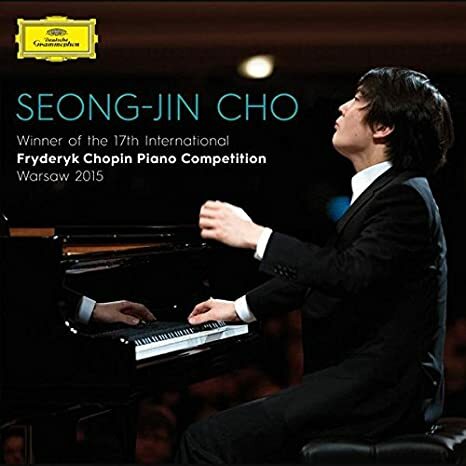 If there is one aspect that stands out on this disc of highlights from Cho’s winning performances at the 17th International Chopin Piano Competition, it is Cho’s large-form narrative. It is something that comes out after repeated listening: the lightness that is first apparent turns into a king of unhurriedness, which in multiple places then turns into a noticeable patient, big-canvas musical perspective. There are premonitions of this in some of the shorter preludes: No. 4, which is simple enough for beginner pianists, a melodic subject consisting of just two notes over gently shifting chords, seems like a journey into infinity in Cho’s hands; No. 9, a single page of music, twelve bars in triple time from beginning to end, sounds like some Tolstoyan epic. Later in the cycle, the scope of Cho's vision is allowed to stretch out a little in No. 15 (The Raindrop) and No. 17. Cho’s Raindrop somehow transforms monotony and grief into a story about self-realization emerging from the innocence of youth. The repeating A-flat becomes the pulse of genius hidden in the folds of human aspiration, not the dull droning of a mundane existence. No. 17, one of the more developed pieces in the set that never seems to quite get its due, is difficult because it is somewhat over-written (even crossing hands)—the tendency in most interpretations is to thicken the texture as it progresses, bogging down its essential lightness and overdramatizing the climax. Cho’s temperament matches perfectly with the prelude, never allowing the writing to drown out the music and giving it a rare touch of aristocracy. In his hands it is like the memory of some happy event, marked by a forgotten passing calamity, which one cannot distinguish entirely from a dream. The final passage, famously punctuated by eleven ground bass A-flats (always A-flat! ), is like a castle made of air, a single hundredth of a unit of force in either direction threatening to dissipate the entire structure of memory and feeling. But the biggest surprises in this respect are, in my opinion, the single Nocturne (Op. 48/1 in C minor) and the third movement of Sonata No. 2, the Funeral March. The Nocturne may have been chosen specifically because of its unusually expansive character; the rhythm of the subject material is almost a slowed down march, which gives way to a contrasting chorale middle section, which is then intruded upon by parallel step-wise double-octave triplets that transform the final passage into a quivering allegro recapitulation of the A section. Cho’s performance gives the piece the scale of a ballade. The twelve or fourteen bars of chorale are imbued with an absolutely magical stillness; the triplet octaves enter from some unseen corner of the universe and ignite the sky like a perfect sunset. The Funeral March is interesting because, in my opinion, the movement is a throwaway in about 85% of all performances. The designation of “Funeral March” seems to overpower any suggestion of imagination in the performer, even very good ones, reducing the range of interpretive options to varying the degrees of crushing finality. But death is actually a very fecund topic of conversation. Death can be a release. Death can be a freeing of the soul. Death can be a return to innocence—and that is the approach Cho seems to take. The opening march is played low and steady. There is no embellishment here, no pushing of the sentiment of tragedy, just the fact of loss. The fortissimo extension does not so much amplify the initial grief as it serves as a counterweight to it, like the memory of the accomplishments of the deceased. This treatment sets up the spare, haunting lullaby that occupies the middle of the movement; by the time you get there, you are already in a different place. While other pianists wonder what they are supposed to do with their years of training during these child-like, virginal 32 bars with two repeats, Cho makes a statement about original sin and the human condition, all the while making time stand virtually still. The recapitulation of the march gradually crescendos, unlike the beginning of the performance, and then seems to lose steam as the reality of the loss returns and its finality is recognized. There is more on this disc than this. Oddly, the first and last preludes stand out for their taste and technical control. The first is texturalized to an unusual extent, with rubatos that move the whole chord structure, not just the voice leads. That might not sound like a good thing, but the performance holds up to repeated listening and in comparison to other versions. In the final prelude No. 24 in D minor, it is incredible the degree to which Cho is able to deliver the allegro appassionato indication without resorting to sheer volume. Entire sections of this technically difficult prelude are performed at a true piano, without giving up any of its agitated sense or forward motion. The runs are also spot-on—in a live performance with no second takes. The fourth movement of Sonata No. 2 is also impressive. There is perhaps no other composition in the repertoire whose underlying concept is so simple yet which inspires so many varying interpretations. Cho plays the parallel lines as colors rather than phrases, blending selective groups of notes with the pedal and producing a spirit-like, half-there gossamer texture—a fitting conclusion to the Funeral March. Cho won the special prize for his Polonaise. My feeling is that there is a bit of novelty in that decision, but it will probably go down in history as a legendarily unorthodox interpretation. After the long introduction, Cho enters the first appearance of the subject at a gentlemanly mezzo-forte. Later he ramps it up to a full power, but that first entry is almost shocking to hear. The performance is also very much segmented and played with a stuttering ¾ mazurka rhythm. Cho’s version deconstructs all of the normal inflection points of the piece, yet gives it a new kind of power. This disc, Cho's first studio recording, came out in November of 2016. It contains the same Chopin concerto he played for the Chopin Competition, except with the London Symphony Orchestra under Gianandrea Noseda, and all four Ballades. “Everyone can play the passagework well, but where you can really show the difference is in the quiet, melodic moments,” Cho says in the liner notes to this album. This is the first thing that stands out when you hear Cho play, and it is the best quality of his interpretation of Chopin’s E minor Concerto. Cho’s lyricism is so eloquent it is almost as if he is speaking actual words. Comparing this studio recording to his Chopin Competition performance, the first movement is slightly faster, the second and third slightly slower. There is also a little more differentiation in this recording: higher highs and lower lows, but that is to be expected when one steps away from a live audience. The choice of repertoire on this album is fairly safe, considering he just won the Chopin Competition. I am always for exploring the deeper catalog. As such, there isn't much that is new on this album, but for the casual classical listener this album can be heartily recommended. Cho's interpretations exhibit a beautiful touch, fluid technique, and a real maturity in phrasing that sets him apart from the crowded field of Chopin pianists. One of the things I like about Cho is that he doesn't seem particularly concerned with the kind of ultra-clarity that a lot of pianists obsess over, as if being able to hear every note distinctly is more important than the overall feeling of the performance. A person who enters the world of Chopin through this album will probably find other performances of this repertoire relatively stiff in comparison. I find the Ballades difficult to judge. They seem to me to be both open to variable interpretation and extremely well-traveled. As music that was supposedly inspired by narrative poems, I find them somewhat diffuse, without a musical center of gravity. My feeling is that Cho's versions here are within the normal range of interpretation for these pieces, possibly somewhat more rhythmic than average, with a somewhat greater tendency to dissolve into pianissimos and maybe a stronger inclination to "flutter" rather than "drive" in the arpeggios. Cho approaches Debussy’s music with a wide angle. Soft introductions give way to expansive climaxes; foreground and background are set apart from each other. I will leave it to others to say whether or not this is the genuine Debussy, but I will say that Cho offers a consistent point of view. This is a dream-like, immensely detailed Debussy. The works selected fall a bit on the abstract side of the composer’s catalogue, and taken as a whole the disc is somewhat difficult to pin down. The most recognizable track—“Clair de lune,” a work that is almost synonymous with child-like wonder and fresh experience—is played with an almost morbid open-wound melancholia. For all intents and purposes, however, those who purchase this album to listen to "Clair de lune" on repeat may simply substitute “Reflections in the water” from Images I. Here Cho sticks to the script, delivering an ebullient, glistening and technically exacting version of this piece, which one might point out is a more difficult composition. Equally satisfying is the very pianistic “Doctor Gradus ad Parnassum” and “The Snow is Dancing” from Children’s Corner. The other piece on this disk that a member of the general public might recognize—“Golliwogg’s Cake-walk” from the same cycle—seems to fall into novelty, albeit in an entertaining way. Cho plays it with an exaggerated syncopation and heavy percussive accents. He may not know, however, that an orchestrated version of this piece is used as theme music on National Public Radio in the US. L’Isle joyeuse signals the end of this long, murky disc with a drawn-out, crashing finale. Overall, this is not my favorite repertoire. But I think it is notable that a pianist in his early-20s can deliver such an immersive approach to a composer whose music strives not for motion but states of being. Considering Cho’s current teacher is Michel Beroff, I think we can expect to hear Cho attempt the later, more complete and more realized impressionism of Olivier Messiaen sometime in the future.